Mitsubishi has an annoying habit of showing us lots of concepts but rarely rolling out new cars. Sadly, the trend shows no sign of slowing as the Japanese automaker has revealed yet another concept hinting at what’s to come while it holds off on existing models here in the United States. The newest concept is called the Ground Tourer-PHEV (GT-PHEV) concept, and it made its debut on Thursday at the 2016 Paris auto show. 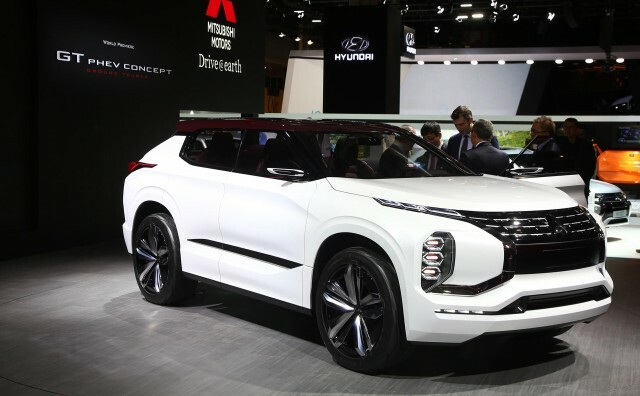 It features Mitsubishi’s next-generation plug-in hybrid system, which combines a high-capacity battery, a trio of electric motors and an internal combustion engine designed specifically for hybrid applications. One of the electric motors is mounted at the front and helps the internal combustion engine, a 2.5-liter unit, drive the front wheels. The remaining two electric motors sit up back and drive the rear wheels. Together, the multiple power sources create a permanent, through-the-road hybrid all-wheel-drive system. A similar setup is featured in Mitsubishi’s supposedly U.S.-bound Outlander PHEV, albeit with a single electric motor at the rear. On electric power alone, Mitsubishi estimates the GT-PHEV will be able to cover 75 miles. The battery has a 25-kilowatt-hour capacity. And with a full tank of gas, the GT-PHEV should be able to increase range by a factor of 10. Importantly, all the power sources are integrated with the vehicle dynamics control system, helping to improve stability by directing torque as needed. Mitsubishi hasn’t mentioned production. However, the automaker describes the GT-PHEV as a high-end SUV designed for long-distance driving. This suggests its design may hint at the next-generation Outlander or possibly even a new Montero (Pajero in other markets). For more from the Paris auto show, head to our dedicated hub. Nintendo to release SNES-themed 3DS XL in the U.S.